At the Mission Store, we believe that thrift shopping should be affordable for any customer, on any budget. Unlike some other mainstream second-hand stores, we make a consistent effort to ensure we are offering our great quality, like-new products at the lowest possible prices. You’ll find thousands of items every week being offered at half-price through our rotating colour tag sales. Every week it’s a different colour tag with the items scattered among the 10 departments in the store, so grab your shopping basket and let the hunt begin! We also regularly offer promotional discounts on various departments and product types. Visit us in-store and check out our tweets @MSLMissionStore. You can now share the savings with your friends and family by purchasing a Mission Store gift card. Gift cards can be activated with any amount starting at $5.00 and are good on any purchases at the store. With such affordable prices, a Mission Store gift card can go so much further than most retail gift cards. We are so committed to ensuring our customers pay the lowest thrift prices that we have designed one of the most rewarding loyalty programs in the thrift market – Our Blue Card. 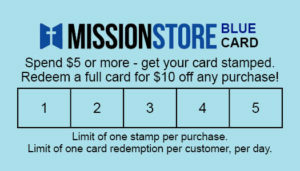 Your Mission Store Blue Card will be stamped on any purchase of $5 or more. With just 5 stamps you will save $10 off your next purchase. Some conditions apply – See in-store for details.